As soon as the region of the galactic plane we are looking for rises, the TeamMopra points the 22 m antenna of the Mopra radio telescope towards the Galactic plane, targeting the G270 region, that means we are now looking at -90 degrees from the Galactic centre, where the Milky Way fourth (or Delta if you are a Star Trek fan) quadrant starts. 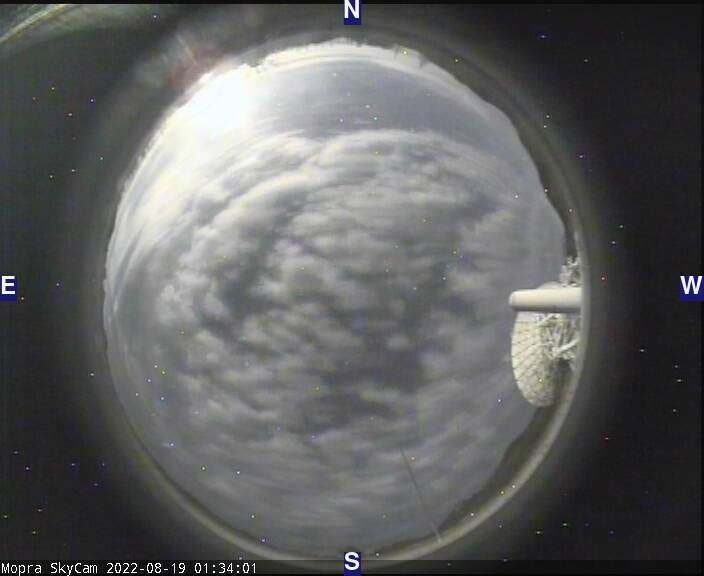 Here a realtime view of the Mopra radio telescope. It is possible to see the Large Magellanic Cloud (as a nebulosity at the left-bottom of the sky circle), one the nearest Milky Way satellites galaxies, at “only” 50 kiloparsec, or ~3.26 x 50000 light years. It is not very far compared to the 2 millions light years of distance of the Andromeda Galaxy. Posted in Mopra CO, Observing, Science! Previous Post: More than 400 explorers! Go TeamMopra Go! Next Post: Experience Mopra up close and personal!